Product prices and availability are accurate as of 2019-04-24 19:03:13 EDT and are subject to change. Any price and availability information displayed on http://www.amazon.com/ at the time of purchase will apply to the purchase of this product. 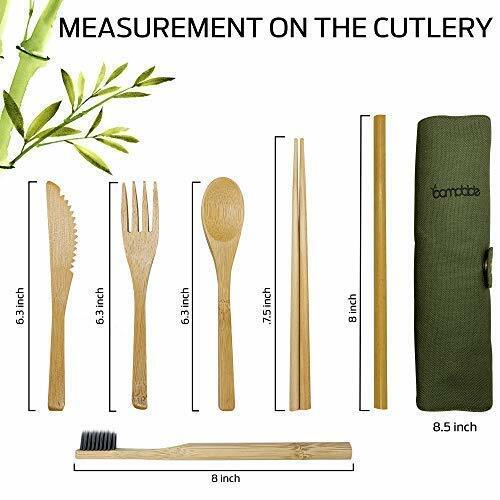 If you are the person who is always seeking an adventure and always out on the road then this reusable bamboo cutlery set is the perfect product for you. Instead of buying in cheap plastic disposable cutlery, why not eat with safe, clean and reusable cutlery set of your own that has antibacterial bacterial and antifungal properties. 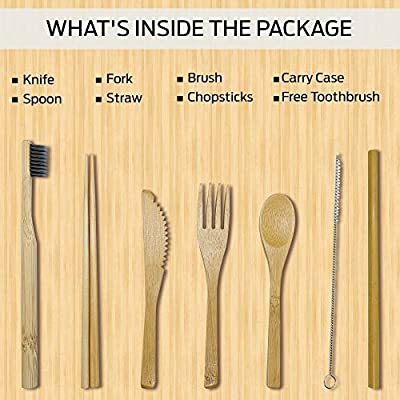 This bamboo travel utensils set includes everything you need for any meal and includes a straw, fork, knife, chopsticks, spoon, toothbrush and a straw cleaning brush. 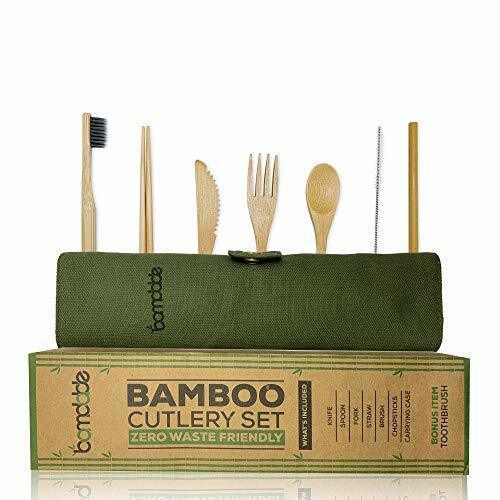 Not only is this travel cutlery set good for you but also keeps the environment clean as it is made from pure and natural bamboo and is completely biodegradable unlike plastic. So when you buy this product, you are not only doing good to yourself but also helping in keeping the planet clean. When at home, you can clean your bamboo cutlery set in a dishwasher without a hassle. 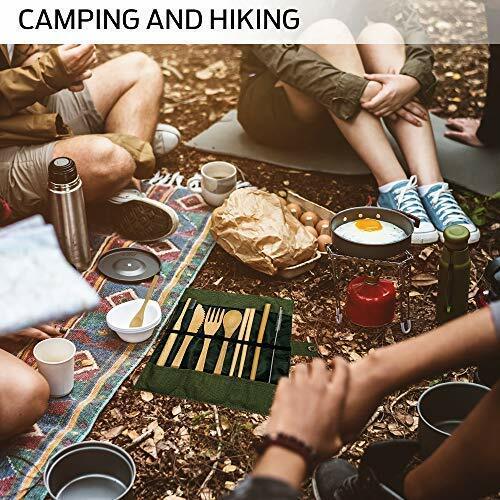 When outdoors or on the road, this set comes with a straw cleaning brush that you can also use to clean other utensils. 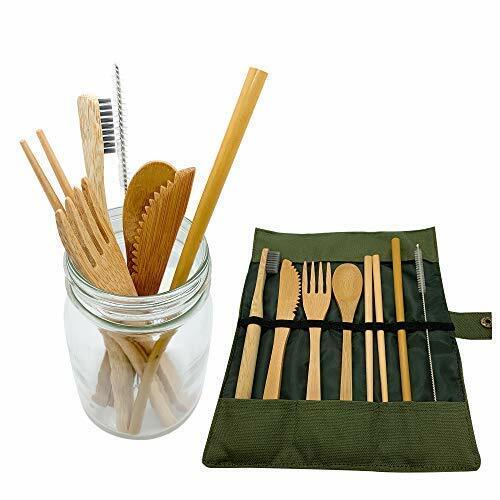 ✔️ANTI-BACTERIAL - Unlike plastic and silverware utensils, bamboo has inherent antibacterial and antifungal properties that keeps this reusable cutlery travel set safe and free from harmful outdoor germs, keeping you healthy. ✔️NON-TOXIC - With wooden eating utensils, you can minimize your intake of harmful chemicals like BPA, commonly found in all plastic items, and plastic nano-particles. ✔️ECO-FRIENDLY - With bamboo portable utensils, you are not only keeping yourself healthy but also helping in reducing plastic waste and making this world a greener place. ✔️LIGHWEIGHT, HANDY AND PORTABLE - This reusable cutlery set is the perfect product for you if you travel and eat outside a lot. No matter where you go, you'll always have your wooden fork and spoon ready for you. ✔️CARRYING CASE INCLUDED - Our bamboo travel utensils set comes complete with a carrying case for safe and convenient storage. With the carrying case, you can place your cutlery set anywhere in your car, handbag or luggage without worrying.